To begin with, there are a bunch of people vocally lending their voices and support to the cause of embracing diversity and equal rights for the LGBT community. Like Jim Irsay, the owner of the Indianapolis Colts…. The Colts have always embraced inclusiveness, tolerance, and a diverse fan base. We welcome ALL fans to Colts Nation. ONE FAMILY! Wilco cancelled an upcoming concert trying to take a stand against discrimination…. And even Seth MacFarlane got into the act…. 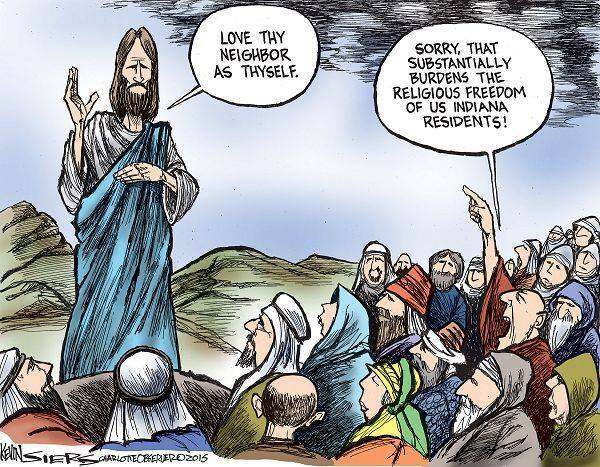 Hey Indiana & states that discriminate against gays: if you wanna live in the past, fine. But when we get spaceships, no spaceships for you. I see where he’s coming from–It does seem to many folks like this law is taking a giant step into the past…. 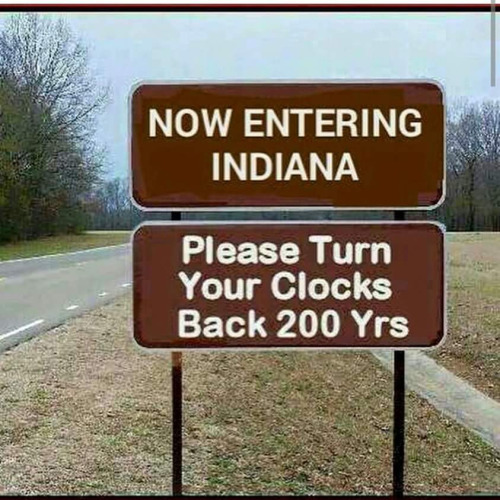 Except for Indianapolis, because they don’t play along with the Daylight Savings thing…. 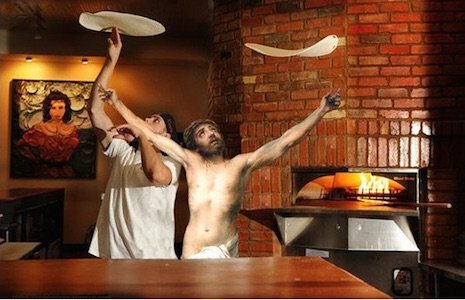 Even when someone does something really gross–like a pizzeria trying to get some free press by declaring that they wouldn’t cater a gay wedding (as if)–good stuff still comes from this sad action. That good thing? The Yelp Reviews are freaking hilarious. You have to weed through some really hateful ones (from both sides), but the funny ones are worth it. There are also some funny pictures…. “With the papers under my arm, I walked to Plainfield’s Maple Hill Cemetery, and found my brother’s grave. My brother, who had been a troubled Vietnam War vet, was gay at a time when being gay was a very difficult thing to be. When he died of AIDS in 1985 in a far-off city, his refuge from his closed-minded native state, some in our family were sufficiently ashamed that his cause of death was not discussed. At the grave I opened the Star. I said, “Well, Charlie, times have changed, thank God. It turns out you were on the right side of history after all.” Then I read aloud as much of the paper’s editorial as tears would let me get through. After your eyes dry out, you can read his entire letter HERE. And then, take a few minutes to laugh with Conan at the absurdity of it all…. 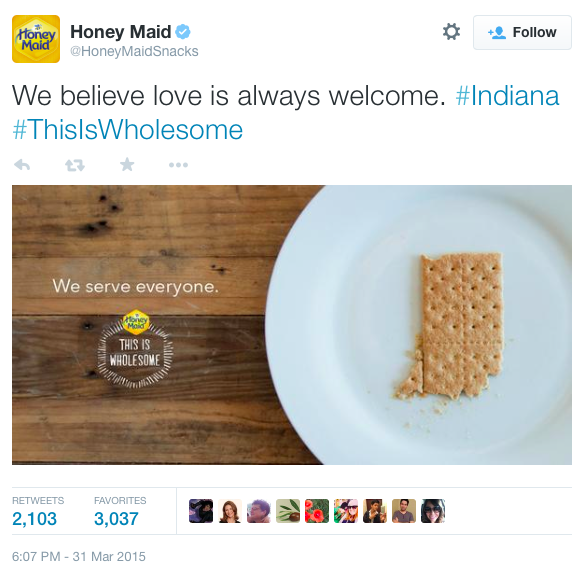 Even Honey Maid graham crackers got into the mix…. Political Graham Cracker sounds like a pejorative term for a South Carolina Senator. Still, I think this one is my favorite. It’s by Kevin Siers of the Charlotte Observer…. This one gets to the heart of it. I know that it’s easy to get down when people keep representing Jesus in a way that everyone but them can see is shameful…. But things ARE getting better. 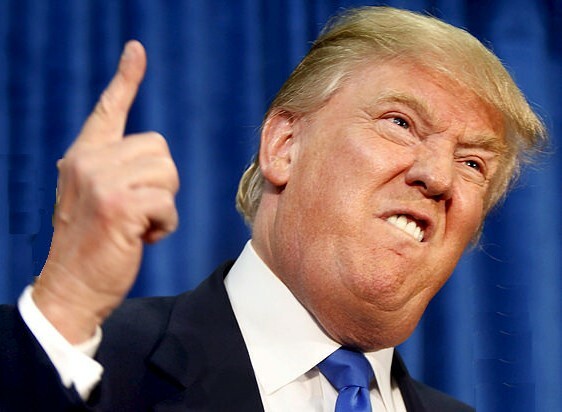 A while ago (after another discouraging setback involving gay Boy Scouts), I wrote THIS POST. I just reread it, and think it still holds up (I have a healthy self-image). Sometimes losing a battle hurts, but the war has already been decided, and LOVE WINS! Human consciousness is progressing. The moral arc of the universe is long, but it’s bending toward justice. There is reason to celebrate. There is reason to laugh. There is reason to be hopeful. This entry was posted in 1) Jesus, 2) Politics, 3) Bathroom Humor and tagged 10 Encouraging Tings, Equal Rights, Honey Maid, Indiana, Jesus, Kevin Seirs, LGBT, Mike Pence, Reactions to Indiana, RFRA, Seth MacFarlane, Twitter Reactions. Bookmark the permalink. Thank you for this. I think this will be my new motto. I don’t think I understand why “Christians” would refuse to serve “sinners” based on the Christian conscience. It sounds like they don’t want to support or celebrate or whatever, the bad behavior of the “sinners”. I find this all quite confusing. Has 1 Corinthians 5: 9-13 been taken out of the Bible? Or have those from Indiana decided EVERYONE is a Christian so we should disassociate from those who are obviously sinful? Even if an LGBT were to tell a cake maker that they were a Christian, then it still wouldn’t be their place to disassociate from the customer. It sounds to me we have begin to worship the law and forgotten the Message. Can anyone explain to me what Biblical grounds Indiana has to support itself?